The Food Alphabet and More: Prepare for Take-Off with the new AirAsia Credit Card! Along with their loyalty program, AirAsia BIG Loyalty will enable AirAsia Credit Cardholders to enjoy the lowest flight fares across AirAsia’s extensive network. AirAsia Credit cardholders get to enjoy exciting perks and privileges every time they spend with their AirAsia Credit Card. Starting with a fantastic Welcome bonus gift of up to 8,000 BIG Points that will start them earning free flights when booking during the Final Call Sales; instant upgrade to the BIG Platinum membership status and Free Priority check in, boarding and baggage every time they fly with AirAsia; and, don’t forget a brilliant low spend per point conversion at Php 22. 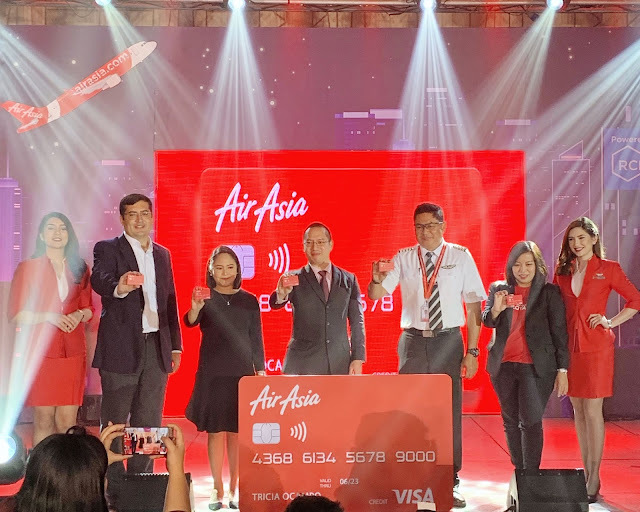 “The partnership that we have with AirAsia and RCBC Bankard enables us to create a credit card product that encompasses all the exciting travel benefits for Filipinos. Travel is one of the top categories of spend amongst Filipino cardholders. Based on Visa’s data, close to 10 percent of Visa total spend is on air tickets. With this credit card product, Filipinos can enjoy flight fares at competitive prices and the travel benefits that come along with it, while earning additional rewards when they spend using their cards. It is our commitment to work closely with our partners to create products and services that are relevant to our cardholders, so they continue to enjoy the perks of using digital payments in the country,” said Stuart Tomlinson, Visa Country Manager for the Philippines & Guam. AirAsia, the world’s leading and largest low-cost carrier in Asia by passengers, services an extensive network of over 130 destinations. Since starting operations in 2001, AirAsia has carried more than 500 million guests and has grown its fleet from just two aircraft to over 200. The airline is proud to be a truly ASEAN (Association of Southeast Asian Nations) airline with operations based in Malaysia, Indonesia, Thailand and the Philippines as well as India and Japan, servicing a network stretching across Asia, Australia and New Zealand and the Middle East. AirAsia has been named the World’s Best Low-Cost Airline at the annual Skytrax World Airline Awards ten times in a row from 2009 to 2018. AirAsia was also awarded World's Leading Low-Cost Airline for the fifth consecutive year at the 2017 World Travel Awards, where it also beat a field of full service carriers to become the first ever low-cost carrier to win World's Leading Inflight Service. AirAsia BIG Loyalty was named the Loyalty Programme of the Year in 2016, and won gold for Best Regional Loyalty Marketing Campaign, Best Use of Direct Marketing, and Best Use of Social at The Loyalty & Engagement Awards 2016. In 2018, it received the Best Use of Technology Award at the 10th Annual Loyalty Conference and Awards. It also took home a gold for Best Loyalty Programme - Travel/Hospitality at Loyalty & Engagement Awards 2018. The AirAsia BIG Loyalty app is available for download from the Apple App Store and Google Play Store. For more information on the mobile app plus other updates, log on to airasiabig.com or follow AirAsia BIG on Facebook, Twitter and Instagram.